It may be small in scope, but GPTouch's (Hima of Grace's Diary) mini-visual novel Jurassic Heart is big on love. And teeth. Lots and lots of teeth. Created in just two days for the 2013 Pulse Pounding Heart Stopping Dating Sim Jam with design and programming by Guts (Thongrop Rodsavas) and art by Piti Yindee, it's a very short but also very funny game that's unexpectedly earnest to boot. You're a young girl getting ready to go out for the day with a friend of yours, Taira-Kun, to visit a music store to help pick out a ukelele to replace the one you inadvertently were responsible for him breaking. The catch? The two of you might have ulterior motives for wanting to hang out and you're sort of nervous about it. The, uh, other catch? You're not exactly in the same place on the food chain. Just click to select your choices whenever given one, and click the cog in the bottom-right corner of the screen to save or load your game whenever you want. There are a few different endings, so don't be shy! While Jurassic Heart is short and also silly, I would hesitate before calling it a true parody because it feels more like a loving homage to the dating simulation genre... albeit one that went a little nuts in the best possible way. A goofy premise will only get you so far, however, but what makes Jurassic Heart stand out is both how straight it plays that concept and how genuine the writing is. Everything from the plot progression to the cadence of the dialogue feels like it came straight out of a more straight-laced dating sim, and the result is a wonderfully weird little gem you would never suspect to be half as heartfelt as it manages to be. It doesn't hurt that the artwork by the talented Piti Yindee is absolutely adorable and fantastic either. 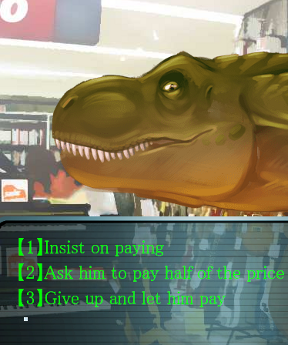 Jurassic Heart may be short and sort of silly, but any fan of visual novel-style romance games will immediately find a lot to love about it... and maybe we'll see a more fleshed out version one day. Hey, it worked for Hatoful Boyfriend! Jurassic Heart Walkthrough now available! I can't really imagine anyone needing a walkthrough for this, but just in case, here's everything you need for sweet, sweet Tyromance. 2. Suggest to split the cost and both pay half. In the music shop, insist on paying for it all by yourself. 2. Allow him to pay. After the music shop, choose "I have tons of student association work/homework to do." Oh no, I tried to play the browser version in Chrome (Windows 7), and I got two different pop-up error windows. One when the game first starts to load, which you can only exit or click Okay (the word 'local' appears in there, but I cannot read Japanese much). The second is similar, but shows up when you'd expect a Play/Start button to appear, something about an error ks:78 that might mention the word 'screen'. I've tried loading with AdBlock disabled, no luck. I've also checked that I have the latest version of Java installed. I get the Jurassic Heart logo and the orange/yellow/green background picture, just nothing to click on to progress me further than the 'Start' screen. Has anybody else had the same issue, or am I just mad? Hi Catherine, I'm sorry you're having issues with the game. I just tried to reproduce what you experienced with Chrome (Windows 7) and could not. The game loads and plays without any issues whatsoever in the latest Chrome on Windows 7. Try emptying your browser cache and reload the page. Also make sure all your browser extensions are disabled, because if you're still experiencing issues, then it must be something you've installed on your computer that is causing the interference. Hi, developer's here! I'm sorry to hear that the web version didn't work for you. Admittedly, I'm still new to the engine and if things doesn't load properly, it'll fail to start for some reasons. Please download the downloadable version instead! Yeah, fixed when I cleared everything from the cache and whatnot. One day, browsers will have more intuitive content settings, so I can tell it to obliterate anything in the cache, cookies etc. for sites I don't visit again within a certain time frame. Sigh. ...TIL I'm better at seducing online tie-wearing, ukulele-playing dinosaurs than I am at real humans. Also, I chose to call myself "Farting", hoping to read a line saying "I love Farting". I'm not sure it worked out too well, but I still chuckled. Now I just need to make a dump account, so nobody will ever be able to trace comments like this back to me. Downloaded the Mac version. Every time I try to open it I get "node-webkit quit unexpectedly." I'm running OSX 6 because my computer's too old to upgrade to 8. Is that the issue, or are other people finding it too? Mac download version runs spiffy quick on Mac OS 10.7.5. Sorry tigrita, perhaps it's time for a new mac. "The, uh, other catch? You're not exactly in the same place on the food chain."